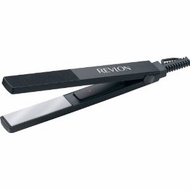 Revlon RVST2001C Perfect Heat Ceramic Super Slim Straightener has ceramic plates, so it's better for your hair. There are multiple heat settings and it heats up in 30 seconds so you can look your best as quickly as possible. This item has an auto-off feature for your safety. There's even a heat insulated bag included.